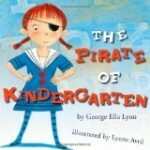 This week the American Library Association announced the top books, video and audiobooks for children and young adults – including the Caldecott, Coretta Scott King, Newbery and Printz awards for 2011. The Pirate of Kindergarten, written by George Ella Lyon, illustrated by Lynne Avril and published by Atheneum Books for Young Readers, an imprint of Simon & Schuster Children’s Publishing Division, wins the award for children aged 0 to 10. After Ever After, written by Jordan Sonnenblick and published by Scholastic Press, an imprint of Scholastic Inc., is the winner of the award for middle-school readers (aged 11-13). The teen (aged 13-18) award winner is Five Flavors of Dumb, written by Antony John and published by Dial Books, an imprint of Penguin Group (USA) Inc. The Dreamer, written by Pam Muñoz Ryan, illustrated by Peter Sís and published by Scholastic Press, an imprint of Scholastic Inc.
Three Belpré Author Honor Books were named: ¡Olé! Flamenco, written and illustrated by George Ancona and published by Lee & Low Books Inc.; The Firefly Letters: A Suffragette’s Journey to Cuba, written by Margarita Engle and published by Henry Holt and Company, LLC; and 90 Miles to Havana, written by Enrique Flores-Galbis and published by Roaring Brook Press, a division of Holtzbrinck Publishing. 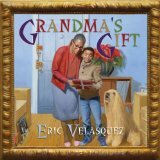 Grandma’s Gift, illustrated and written by Eric Velasquez, is the 2011 Belpré Illustrator Award winner. The book is published by Walker Publishing Company, Inc., a division of Bloomsbury Publishing, Inc.
Three Belpré Illustrator Honor Books for illustration were selected: Fiesta Babies, illustrated by Amy Córdova, written by Carmen Tafolla and published by Tricycle Press, an imprint of the Crown Publishing Group, a division of Random House, Inc.; Me, Frida, illustrated by David Diaz, written by Amy Novesky and published by Abrams Books for Young Readers, an imprint of ABRAMS; Dear Primo: A Letter to My Cousin, illustrated and written by Duncan Tonatiuh and published by Abrams Books for Young Readers, an imprint of ABRAMS.